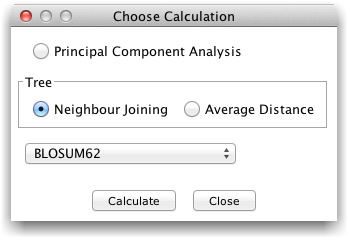 The Calculations Dialog (shown above) is opened via the Calculations→Calculate Tree or PCA... menu entry. It allows you to select the type of alignment analysis calculation (PCA or Tree), and the sequence similarity score model that will be used to perform the analysis. Jalview can import substitution matrices in both AAindex and NCBI format (see e.g. ftp://ftp.ncbi.nlm.nih.gov/blast/matrices/). In Jalview 2.10.2, the easiest way to import new models is to drag the score model file onto any alignment window. See the Substitution Matrices Documentation for more information.